Emmet Dalton MC (4 March 1898 – 4 March 1978) was an Irish soldier and film producer. He served in the British Army in the First World War, reaching the rank of Major. However, on his return to Ireland he became one of the senior figures in the Dublin Brigade of the guerrilla Irish Republican Army which fought against British rule in Ireland. He was a close associate of Michael Collins and travelled separately from the Irish Treaty negotiating team with Collins to London. He was Military Liaison Officer for the Treaty talks. During the Irish Civil War he held one of the highest ranks as Major General in the pro-Treaty National Army but resigned his command following the death of Collins. He later founded a film production company in London and founded Ardmore Studios in Wicklow together with Louis Elliman in 1958. Producing a number of notable pictures in the 1950s and 1960s. James Emmet Dalton was born to James F. and Katharine L. Dalton, an Irish-American father and an Irish mother, in Falls River, Massachusetts, United States on 4 March 1898, but the family moved back to Ireland when he was two. He grew up in a middle class Catholic background in Drumcondra in North Dublin and lived at no. 8 Upper St. Columba's Road. He was educated by the Christian Brothers at O'Connell School in North Richmond Street. He joined the nationalist militia, the Irish Volunteers in 1913 and the following year, though only fifteen, was involved in the smuggling of arms into Ireland. Dalton joined the British Army in 1915 for the duration of the Great War. His decision was not that unusual among Irish Volunteers, as over 20,000 of the National Volunteers joined the British New Army on the urgings of Nationalist leader John Redmond. Dalton's father, however, disagreed with his son's decision. Emmet Dalton initially joined the 7th battalion of the Royal Dublin Fusiliers (RDF) as a temporary 2nd Lieutenant - by 1916, he was attached to the 9th Battalion, RDF, 16th (Irish) Division under Major-General W.R. Hickie, which contained many Irish nationalist recruits. During the Battle of the Somme, in September 1916, Dalton was involved in bloody fighting during the Battle of Ginchy, in which over 4,000 Irishmen were killed or wounded. Among the casualties was Tom Kettle, a former nationalist Member of Parliament and personal friend of Dalton's father and Emmet. Dalton was promoted to Major and awarded the Military Cross for his conduct in the battle. Afterwards he was sent to Palestine, where he commanded a company and then supervised a sniper school. In 1918 he was re-deployed again to France, where he served as a staff officer. On demobilisation in 1919, he returned to Ireland. There finding his younger brother Charlie had joined the IRA. Dalton himself followed suit. He later commented on the apparent contradiction of fighting both with and against the British Army by saying that he had fought for Ireland with the British and fought for Ireland against them. 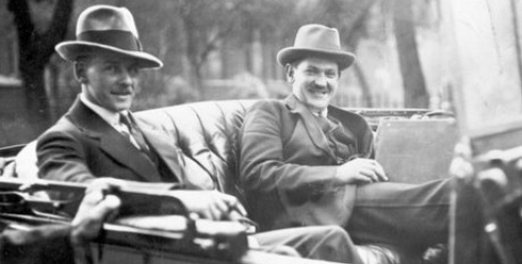 He became close to Michael Collins and rose swiftly to become IRA Director of Intelligence - and was involved in the Squad, the Dublin-based assassination unit. On May 14, 1921, Dalton led an operation with Paddy Daly which Dalton and Collins had devised. It was designed to rescue Gen. Sean McEoin from Mountjoy Prison using a hijacked British armoured car and two of Dalton's old British uniforms. 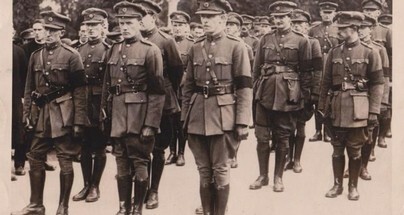 Dalton followed Collins in accepting the Anglo-Irish Treaty in 1922 and was one of the first officers - a Major General - in the new National Army established by the Irish Provisional Government of the Irish Free State. The Treaty was opposed by much of the IRA and Civil War between pro and anti-treaty factions eventually resulted. Dalton was in command of troops assaulting the Four Courts in the Battle of Dublin which marked the start of the war in June 1922. At Collins instigation Dalton as Military liaison officer with the British during the truce took control of the two 18 pdr guns from the British that were trained on the buildings. He became commander of the Free State Army under Mulcahy's direction. He was behind the Irish Free State offensive of July–August 1922, that dislodged the Anti-Treaty fighters from the towns of Munster. Dalton proposed seaborne landings to take the Anti-Treaty positions from the rear and he commanded one such naval landing that took Cork city in early August. In spite of firm loyalty to the National Army, he was critical of the Free State's failure to follow up its victory, allowing the Anti-Treaty IRA to regroup resuming the guerrilla warfare started in 1919. On August 22, 1922, he accompanied Michael Collins in convoy touring rural west Cork. The convoy was ambushed and Collins was killed in the firefight. Dalton had advised him to drive on, but Collins, who was not an experienced combat veteran, insisted on stopping to fight. 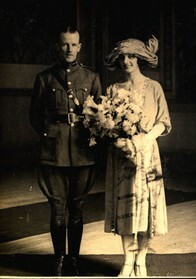 Dalton got married shortly afterwards in Cork's Imperial Hotel. 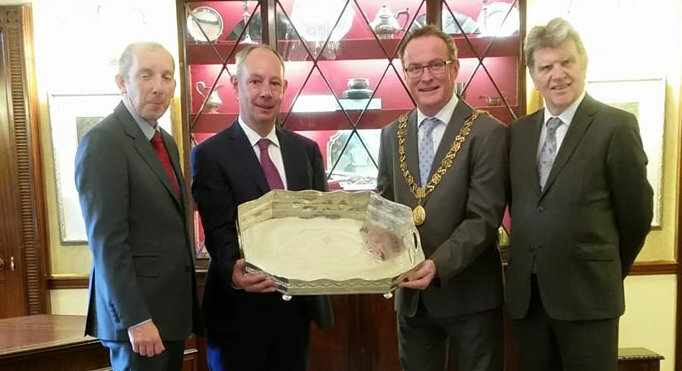 He was presented with a gift of an Irish silver tray inscribed ‘Presented to Major General J E Dalton, by his brother officers IRA engaged with him on active service in Cork on the occasion of his marriage Cork 1922’. By December 1922 he had resigned his command in the Army. He did not agree with the execution of republican prisoners that marked the latter stages of the Civil War. After briefly working as clerk of the Irish Senate, he left this job to work in the movie industry. Over the following forty years, he worked in Ireland and the U.S. in film production. In 1958 he founded Irish Ardmore Studios in Bray. His company helped produce films such as The Blue Max, The Spy Who Came in from the Cold and The Lion in Winter, all of which were filmed in Ireland. His daughter is Irish actress Audrey Dalton. Emmet Dalton died in his daughter Nuala's house in Dublin in 1978, on his 80th birthday. Never having seen the film that Cathal O'Shannon and RTÉ had made on his life. During the making of the film they visited the battlefields in France (including Gincey and Guillemont in the Somme), Kilworth Camp in Cork, 'Béal Na Bláth' and other places which he had not visited since his earlier years. His wish was to be buried as near as possible to his friend Michael Collins in Glasnevin Cemetery in Dublin. He was buried there in March 1978 after a full Military funeral. None of the ruling Fianna Fail Government Ministers or TDs attended. Woodwards specialist bi-annual auctions of Irish &English Silver attract interest globally and with a strong leaning towards Cork, Limerick and Dublin silver, and they have built up a following of discerning buyers across the country, and internationally with live internet bidding.